James Lee Pattinson, also nicknamed “Patto”, is an Australian cricketer who has played all formats of the game. He was born in Melbourne, Victoria on 3 May 1990 and is a renowned Victorian player. He’s a right-arm fast bowler and bats left-handed. His brother, Darren Pattinson is also a cricketer and played one test for England in 2008. He was considered Australia’s next big fast bowler after Glenn McGrath and Brett Lee. Pattinson first played for Dandenong Cricket Club in Victorian Premier Cricket before he went on to play for the Australian U-19 team. Pattinson started as a fast bowler and also has the ability to hit the ball hard. He had constantly been under the radar of the Australian Board who later selected him to play for the team in 2011. He started playing for the senior national side at just 22 years of age, making him one of Australia’s youngest ever cricketers. His performances in the Victorian Premier Cricket availed him the option to play for his country. He has represented the following teams - Australia A, Australia Under-19s, Dandenong, Kolkata Knight Riders, Melbourne Renegades, Victoria, and Victoria Under-19s. 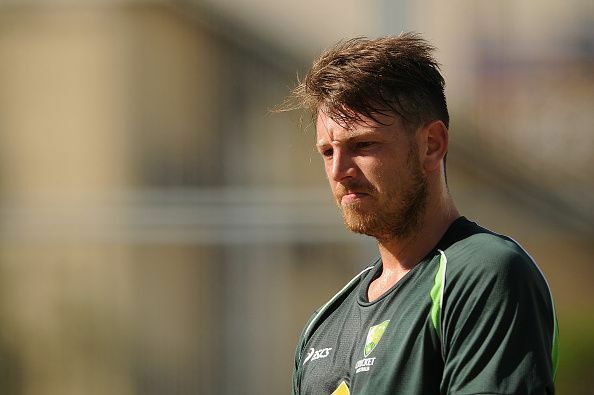 James Pattinson made his international debut in an ODI against South Bangladesh on 11 April 2011. He picked up one wicket, and conceded 39 runs in 7 overs. He then made his test debut in the same year on 1 December, playing against New Zealand. He impressed on his debut by picking up New Zealand’s first five wickets in the second innings, finishing with figures of 5 for 27. His haul helped Australia achieve a nine-wicket win. He made his T20 debut on 13 October 2011. He picked up 1 wicket, and conceded 32 runs in his four overs. In his debut test series against New Zealand, Pattinson left an impressive mark after picking two five-wicket hauls in two matches. That earned him the Man of the Series Award. He went on show his talent by picking up 6 wickets in a Boxing Day test against India in 2011. He returned to the Australian test team in 2015, again achieving another five-wicket haul against West Indies. He bowled at an immense pace and was one of the few bowlers having the ability to bowl at that constant pace. His performances in the test and ODI formats earned him a place in the squad for the ICC Champions Trophy 2017. Pattinson’s only ever embarrassment was in 2013, when he suspended with a few other players for breach of discipline. Repeated errors in conduct caused a few players to take a flight back home. Pattinson’s club career is highlighted by his performance against New South Wales, where he broke a record by picking up 6 wickets in his 10 overs. The rise was steady, and in 2011 he was picked up IPL team Kolkata Knight Riders for US$100,000. Other clubs include the Rangpur Riders, Melbourne Stars and the Renegades. He signed a contract under Nottinghamshire in England in 2017, and recently played in April 2011. David Warner: Is he as good as the numbers suggest?